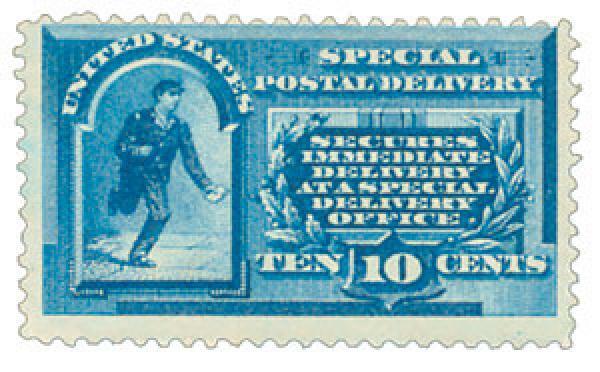 U.S. #E1 – The trademark of the Special Delivery stamps was the running post office messenger, who was often referred to as the “running speedy boy.” He is one of the few postal figures who was modeled after a living person. During one session, the engraver was so engrossed in his work he didn’t realize the length of time the boy was forced to stand on one foot. Eventually, the boy became completely exhausted and collapsed to the floor. On October 1, 1885, the Special Delivery service made its debut, and the U.S. Postal Department issued a 10¢ stamp to inaugurate its new service. Used in addition to the regular postage required, this stamp paid for an extra service – the immediate delivery of a letter within one mile of any other Special Delivery post office. Assistant Postmaster General Frank Hatton first proposed the Special Delivery Service in 1883. At the time, the Postal Service delivered twice a day in major cities. Private companies were used for urgent business mail that couldn’t wait for those scheduled deliveries. Hatton believed the companies were cutting into the Postal Service’s profits. On March 3, 1885, Congress approved the Special Delivery Service Act. U.S. #3082 – Dean’s entire career consisted of three major films produced in just 17 months. 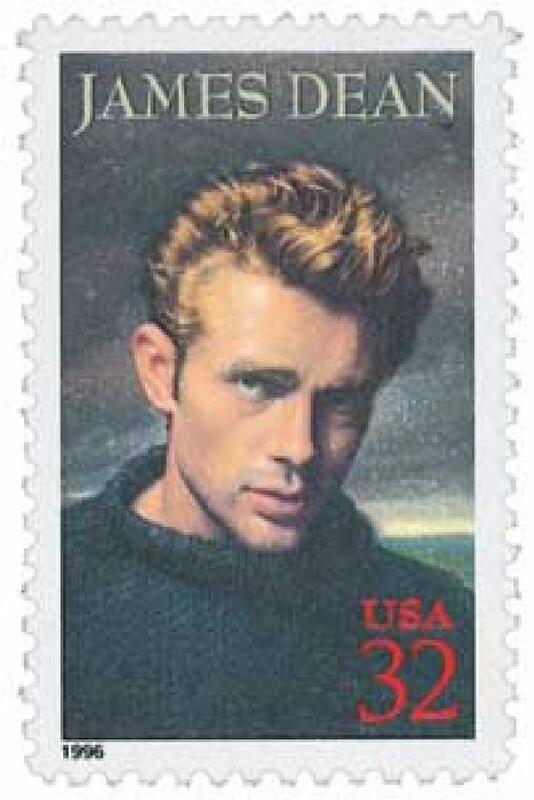 A rising star in Hollywood, James Dean’s death on September 30, 1955 was a shock to us all. Dean was a rebel who took the nation by storm during the conservative 1950s. A New York Times article dismissed Dean as “an honor graduate of the black leather jacket and motorcycle school of acting and living it up.” Ironically, that’s exactly what appealed to his youthful following. Dean symbolized the frustration of teenagers everywhere. U.S. #1565-68 honors the Continental Army and other Revolutionary War troops – the precursors to our modern military. On September 29, 1789, Congress created the U.S. Army after multiple requests from President George Washington. 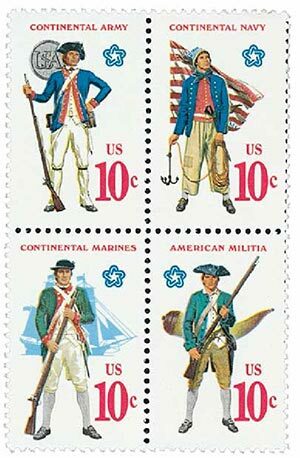 After the Revolutionary War, the Continental Army was largely disbanded, as the U.S. legislature believed that a standing army during peace time was dangerous and unnecessary. Some troops remained active to guard munitions and about 700 members of state militias were prepared to take on potential threats from Native Americans and the British. 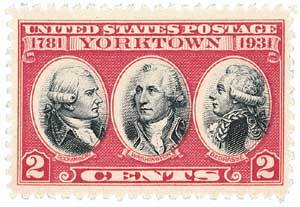 U.S. #703 honors the commanding generals at Yorktown: Washington, Rochambeau, and Degrasse. On September 28, 1781, American forces launched the last major land battle of the Revolutionary War – the Siege of Yorktown. During the American Revolution, the ability to resupply armies, deploy troops, and transport munitions stored in towns along Virginia’s inland water routes was dependent on control of the Chesapeake Bay. The British campaign to secure this vital region ultimately led to the surrender of British General Cornwallis and an American victory in its war for independence. 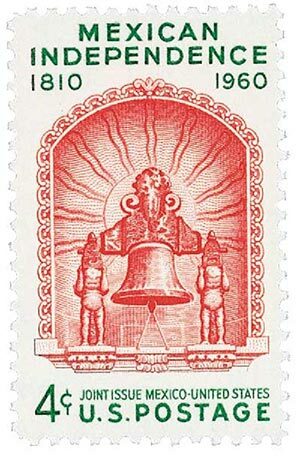 U.S. #1157 – This stamp marks the start of Mexico’s war for independence in 1810, though Spain didn’t recognize it until the war’s end in 1821. After more than a decade of fighting and over 20,000 casualties, Mexico officially gained its independence from Spain on September 27, 1821. Mexico had been under Spanish control since 1521 and rarely challenged it until the early 1800s with Napoleon’s occupation of Spain. It was then that Mexican priest Miguel Hidalgo y Costilla launched a revolt. On the night of September 15-16, 1810, Hidalgo declared war on the colonial government in what has been named the Grito de Dolores, or Cry of Dolores. By morning, the revolutionary army sought independence and marched to Guanajuato, an important mining center controlled by the Spaniards and creoles (people of pure or mostly Spanish ancestry). The Spaniards and creoles locked themselves in the granary, but were captured on September 28. Most were killed or exiled.